NEW YORK (AFP) -- New York's fall auction season kicks off this week with a sparkling array of masterpieces expected to draw bidders from around the world at Christie’s and Sotheby’s. From Edvard Munch’s Expressionist “Girls on the Bridge” to Willem De Kooning’s abstract “Untitled XXV,” the two major auction houses have put together an impressive collection of paintings and sculptures from some of the 20th century’s greatest names for the prestigious sales running Monday to Thursday. There will be dozens of Picassos and Chagalls on display in the auction houses’ galleries ahead of the sales -- together with paintings by Kandinsky, Sisley, Dubuffet and Rothko -- rivaling the exhibits at some of the neighboring major museums. Starting prices are often set well below artworks’ estimated values in order not to discourage anyone interested and attract as many buyers as possible, says Christie’s America president Brook Hazleton. There’s no shortage of bidders in the United States, Paris, London -- and increasingly Asia, with growing Chinese fortunes spent on internationally recognized works at both major auction houses. The sales will serve as a barometer of the global art market, which did well during this year's spring auctions despite a slow 2015. Records could be broken this time. Munch’s “Girls on the Bridge,” a 1902 canvas depicting women in colorful dresses that contrast with a dark, anguished landscape, has broken records every time it has gone under the hammer. It went for $30.8 million in 2008, compared to $7.7 million in 1997. This time, Sotheby's estimates its worth above the $50 million. The Norwegian artist’s most famous work, “The Scream,” became the world's most expensive work of art to sell at auction in 2012, at $120 million. Claude Monet’s “Meul,” another likely centerpiece of the autumn season -- to be sold by Christie's -- is part of a series of haystacks the artist painted during the winter of 1890-91. It’s estimated at $45 million. As with many great Impressionist works, prices are determined by scarcity: Most are now in national museums and out of reach for private collectors. The record for a Monet came in 2008 with the bucolic “Le Bassin aux Nympheas,” which brought in $80.5 million in London. 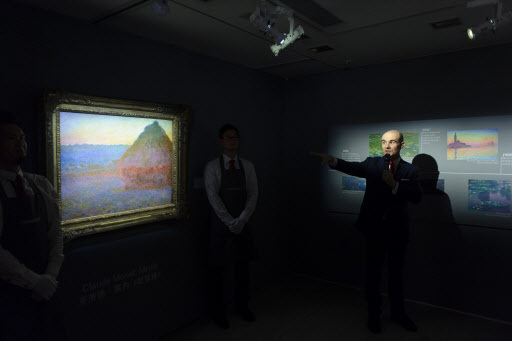 Testament to Chinese collectors’ growing clout, the painting was exhibited in Hong Kong at the end of October before it went on display in New York. The prolific Picasso is also omnipresent in next week’s sales. At Christie’s, his painting “Bust of a woman,” inspired by his mistress and muse Dora Maar, is estimated at between $18 and $25 million. At Sotheby’s, the spotlight returns a long-running series of Picasso paintings titled “Painter and his model,” this installment from 1963, owned by New York‘s Oestreich family until now. The artwork is estimated between $12 million and $18 million. There’s no shortage of gems among contemporary art for sale. De Kooning is set to figure prominently next week with the imposing “Untitled XXV” -- 2 by 2.2 meters -- featuring his typically vigorous, multicolored brush strokes. Christie’s estimates it at $40 million. Gerhard Richter’s “Abstraktes Bild (809-2)” is another abstract jewel, a canvas dominated by yellow and blood red, valued between $18 million and $25 million. An Andy Warhol black and white self-portrait also goes on sale, from his “Fright Wig” series -- with staring eyes and a spiky wig -- painted in 1986 several months before his death. It’s valued between $20 million and $30 million. That’s 10 times the amount of another self-portrait, by Keith Haring, “Self portrait for Tony,” finished just before he died of AIDS in 1990.